Welcome to Russell Loyola Sullivan! Now there’s an activity that I love, too. 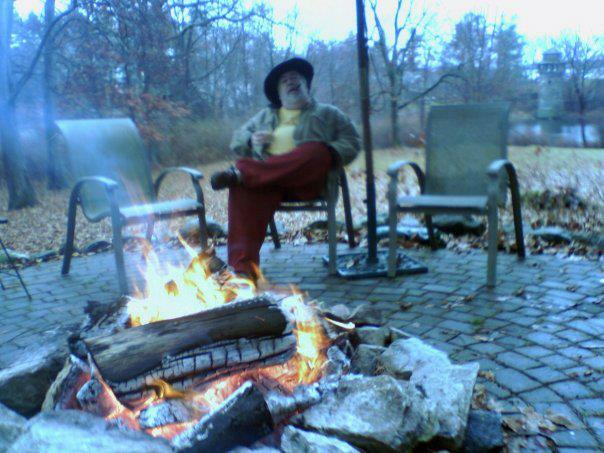 Sitting beside the fire, preferably with a good hot coffee! Tell us about yourself—you know, all that stuff that makes you interesting! I am a most unlikely character to be among the folks you showcase here. I grew up in a small fishing village – Brent’s Cove–in northern Newfoundland. My dad died when I was ten, and from there we moved to a variety of places; St. John’s, Montreal, West Palm Beach–the” not so affluent” side, and now I reside in the most beautiful New Hampshire. I am a CA/CPA with a small practice worked by my wife and I. She is also a CPA. Most folks tell me I am not the typical CPA. I can only hope that is meant as a compliment. We are lucky to have a beautiful piece of land to live on where our two dogs, a Great Dane and a Rat Terrier, love to frolic and bother the many birds and animals that come to visit and drink from the ponds. Sounds like a wee bit o’ heaven to me! When and why did you begin writing? I remember writing my first poem to impress a young lady. Somehow it took—no not the young lady, the writing—and I began writing poetry on a regular basis. Over a period of forty years or so I have written too many to remember–most have been tossed away in some careless disregard on my part. I still write poetry and with the computer I have retained a nice collection. In addition to poetry, I also love to write short stories and have for a considerable number of years. Those I have held onto but for some odd reason have not attempted to publish. I am a Hansel & Gretel writer–I think I just made that up. I leave a trail behind me on a storyboard that I can go to and check various names, places, events that I meet up with once again as I move on through the mosaic. I usually have a “big picture” in mind, but I often write to my own surprise. Characters and events take on a life of their own and force my thinking in a direction I had not intended. I believe very strongly in a “happy” ending–but, I also understand that there must be sacrifice and loss to give any credence to the story. (Laughing here) I think you’re my first “bread crumb” writer! What other writer inspires you? Your work? I am a fanatical reader. Fantasy is my favorite read but I often jump into science, especially books concerning the Universe. I also have an appetite for books that deal with the evolution of the spiritual–not so much religion–but the grand myths and holy writings being examined and interpreted by contemporary writers. I can’t say I have adopted any one writer’s style. I am almost always impressed by what I read. A few books have disappointed me, those I quit reading. The odds are if I finish I am impressed. Terry Goodkind, Terry Brooks, the late great Robert Jordan are among my favorites. I have nothing of their flair for description and narrative. I tend to be quick, precise. I give a setting, perhaps a smattering pause and then I move on with the journey. I have read all of Thomas Moore’s books. He wrote “Care of the Soul” and many others. I greatly admire his ability to explain the complex to such as myself. In “Science and the Universe” I little remember the author. I get pulled in by the topic–membranes–strings–infinity–grand design, and a host of other words that speak of wonder and forever. Well, that question made me scratch my head. I have just finished my first full length novel, “Seals of the Ages”. I have a first draft of the second book, “The Druid and the Flower”, and I am about one-third through the third book in the series. Of that grand collection, lol, I believe I like the second book best. The second, also a fantasy of course, resonates with our present economic circumstances in the world. I will not give away the plot, but I found myself wondering at times if I was writing fiction or non-fiction. I have two wonderful sons. They each have an incredible breath of personality. As I watch them grow (young men in their thirties now) it amazed me the broad and differing philosophies that they both possess. I also love to listen keenly to folks when they rise to defend a view or share an opinion. I tend to poke a little and from their reaction I often get what I term the “back-handed” truth. Something will get said that reveals their character with little to do with the topic but much to do with what they truly feel. The worst, ok, this one will be a little expansion on the first question posed above. I have an excellent reading and speaking vocabulary but I am grossly unable to spell or type. Spellcheck laughs at me. I have to Google words in a sentence to figure out how to spell them correctly. Even that gets interesting as I tend to whip out a chapter in one sitting without a glance to what I have typed. I am fairly certain I am the only person in the world to have made “MICROSOFT WORD” cry. 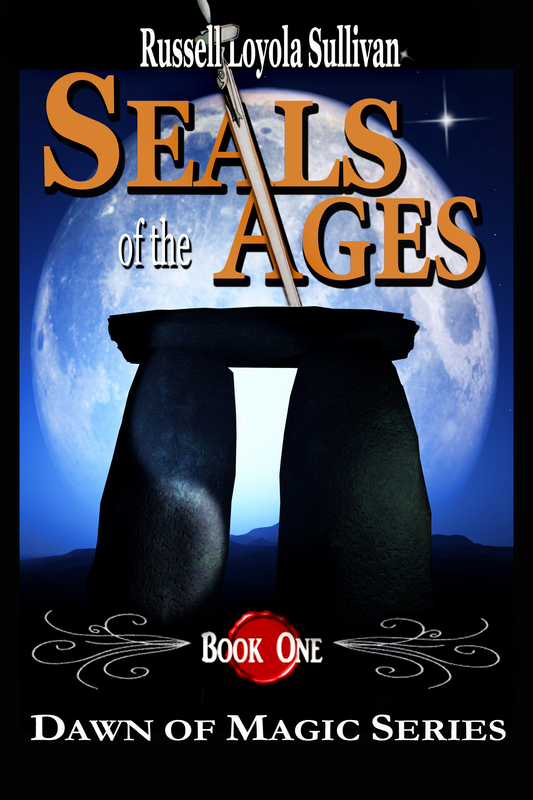 I just released “Seals of the Ages” which is now available in paperback on CreateSpace and on Amazon in both paperback and digital. How big do you plan to make the series—if that is predictable? I plan to finish the series, “Dawn of Magic” in no greater than five books. Each book will stand on its own with its own plot and finality. Each book will have a connection, but not the same heroes and villains. My books are meant to be read by everyone, teen and up. I believe “Seals of the Ages” is a fast-paced read. I do my best to satisfy those who like to “get on” with the story and those that like to understand the setting and the situation before moving on. It is a fantasy novel, but I believe it also gives the reader an opportunity to ponder difficult choices that all of us face in real life–maybe not as world shattering but important and provocative. Well, I am new, so anything I say will be new to my readers. (laughing here) Ok, ok, I played WOW with my son for way too much time and way to many years to admit. We ran a guild where we ventured out with many like kind folks and had a wonderful time. Eventually the entire series will be on Amazon and as noted earlier for “Seals of Ages”, I plan to publish on CreateSpace. Thank you for spending time with us Russell. It’s always nice getting to know another new writer. We wish you much success with your series. And, how about publishing some of that poetry, heh?